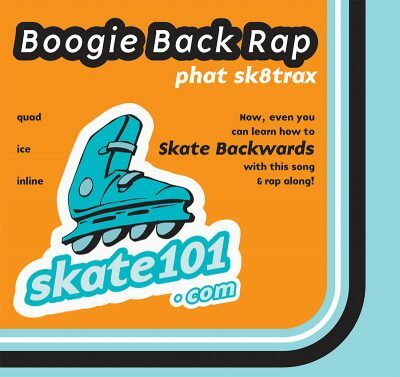 Skating backwards looks hard, but you can learn to do it in no time with the “Boogie Back Rap” song and video. This Top Ten Single of the Year (Village Voice) by Jenny Jen and Taki76 (formerly known as Phat Sk8trax) reveals the secrets you’ll need to groove your boogie back, like a real cool cat. When they clear the rink for backward skaters only, you won’t have to take a seat! Learn how to skate backwards on quads, ice skates, and inlines with the first and only Backwards Skate Song. Seven Funky Mixes to Choose from, including 4 Karaoke Dance Tracks. Learn how to skate with Skatewoman at Skate 101, The world’s first & only singing skate teacher. She raps her rhymes on skates to demonstrate. She does it on ice, quads, and inline skates.